Okay, it’s officially winter. You can never have too much windshield washer fluid, sand, or salt. Maybe you need a new window scraper to replace an old or missing one. For the house, you might need a space heater or a humidifier (so you don’t keep getting sick). Anyway, you get the idea: Come to Durfee’s for all your winter needs! 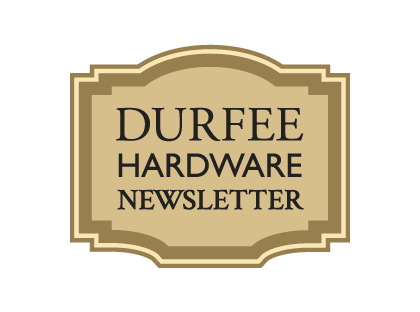 I gave a couple of my old friends some Durfee Hardware coffee cups a while back. They both live out-of-state now, but I thought they might enjoy a reminder of RI (you may have seen these cups on the counter at the store). What’s really great is one of these friends sends me a text every few months with a picture of the coffee cup and text that says “Having coffee with Ray today”. This friend really hit-it-off with my Dad and thought he was a fantastic guy. It’s really great that he sends me a note every once-in-a-while to let me know he still thinks about Ray from time to time. It’s too bad we don’t have a coffee cup for everybody that is missed. Anyway, it’s comforting to think that there are some people out there who pick up a Durfee coffee mug and remember my Dad. There was some kind of object put on the window sill that I had just refinished last year that left a kind of a chemical burn on the surface. I had to sand it out, re-stain that spot, and put a urethane over the whole thing again. While that may seem like bad news, it actually came out pretty great. You’d never know there was an issue – looks like new. Okay, I really stepped in it this time. There was a little finish that peeled-off the oak flooring near my back sliding door. I thought I would just sand it and refinish the small spot. When I started sanding, I realized that the board was soft so I took my circular saw and cut it out (I would highly recommend using a corded saw for this kind of thing – battery powered ones are still not strong enough). When I got that board out, the next board looked rotted. Man, it was like pulling a thread on your sweater. I was pulling up a lot of boards by the time I was done. It appears that the old door had leaked during driving rains, which over time damaged the oak. Then as I started to clean up the mess, I noticed that the plywood had some ‘give’ to it. I thought, ‘that seems odd, there should be a joist at the seam between these two pieces of plywood’. When I went downstairs, I found that the joist was completely rotted. The water went into the seam and just sat on the joist. So, I now had to jack up the floor a little with my bottle jack to get a new joist in there. I cut the bad part out, and bolted a new joist to what was left of the old one. Now I am putting down new tongue-and-groove oak flooring. I put some rosin paper down so the boards won’t creak. It’s nice that I have a router table so I can put a new groove in the end of the board when I have to cut the oak to fit my floor. I decided to use trim screws (screws with a little tiny head) so I wouldn’t have to use a nail gun. They are actually working pretty great. They snug-up the new boards to the old ones nicely. This is going to take some time to finish up – then on to painting the family room.